GATE Preparation Tips – Find all tips and tricks to ensure a crack through GATE 2019. Get all related information on GATE notification 2019. Graduate Aptitude Test in Engineering (GATE) is a national level qualifying examination. The GATE scores help students to enroll themselves into M.Tech/M.Sc in relevant streams of Engineering, technology, Science and Architecture. The GATE Score card is valid for 3 years after the result gets published. Hence candidates with good scores are also eligible to attain the opportunity to start their career in PSU jobs. The notification for GATE 2019 is out! This year Indian Institute of Technology Madras (IITM) shall be the organizing institute. The online computer-based exams shall be held on February 2, 3, 9 and 10, 2019 in forenoon and afternoon shifts. The first shift will be held from 9 AM to 12 PM. And the second shift will be conducted from 2 PM to 4 PM. There will be multiple exam centers across India & abroad to ensure maximum coverage. A new paper, Statistics (Code -ST) will be present this year and hence the total number of papers will be 24. The GATE Hall Ticket 2019 shall be probably available from 4th January 2019. Most importantly, here you can explore important tips in this post on Gate Preparation Tips 2018. You have a good time in hand to prepare yourself for the Gate 2019. Students from all over the country keep waiting year long for one of the most prestigious exams in the country – GATE. And you must utilize this precious time in the best way possible to your advantage. So, here we have given you some suggestions that can help you prepare. Prepare well for the General Aptitude (GA) Section, which shall be common for all. Arrange the subjects of your specialization with greatest to least weightage and prepare as per importance. Identify important topics, your areas of weaknesses & strengths and likewise, create your own study plan. Weightage analysis of all topics based on previous year papers – Allocate time to cover all important topics and practice all the frequently asked questions. Try creating a weekly plan breaking it down to daily tasks, and giving sufficient time to each subject and consequently completing the entire syllabus. It is a good practice to track your progress regularly and re-strategize again if you’re lagging behind or spearing ahead of your initial plan. It is essential to have a thorough knowledge of fundamentals. Initially, focus on understanding concepts followed by practicing questions. Standard textbooks are a great source to gain conceptual knowledge. There are plenty of video lectures available these days which can also help students learn quickly. Don’t attempt mock test series at the beginning of your preparation as it will not give you true insights of your preparation level and might also discourage you. But in the last few days, give as many as you can. 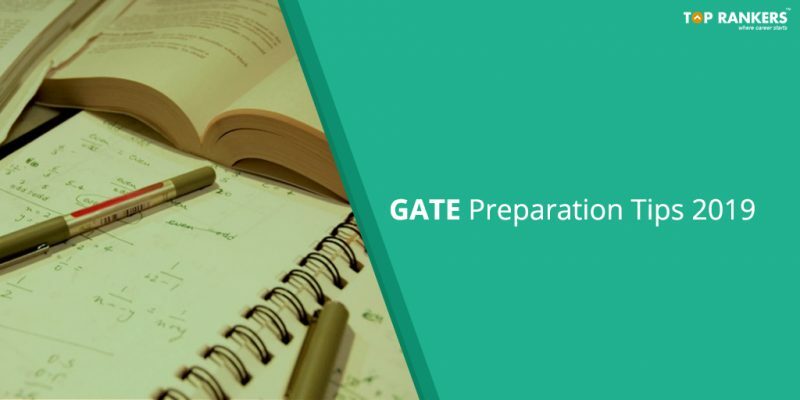 Make a schedule of your GATE preparation and then grab mock tests on each topic. Always target to study topic by topic to finish the whole subject. While studying any topic, also make short notes for every important concept, definition, derivation or formulae. Recall the important concepts time to time attempting short tests on all topics. Always clear your doubts if you cannot proceed on a question or concept. Reach your examination center city before two days if you are residing outside the city and try to take proper rest before the exam day. All your hard work and preparation will be tested in just 3 hours, so make sure that you don’t lose your cool & focus during the exam. So, tell us, did you find our post on GATE Preparation Tips 2019 helpful? Then, keep visiting us regularly for more preparation tips and keep writing to us in the comments section below.